Well today Kelita and I tackled the bed again!! We figured we had about 3 plus hours of work ahead of us and were both secretly dreading the whole thing this morning. Weren't we pleasantly surprised when an hour and a half later we walked out of the basement basically finished the bed!!!!! Can I hear a YAHOOOO!!! 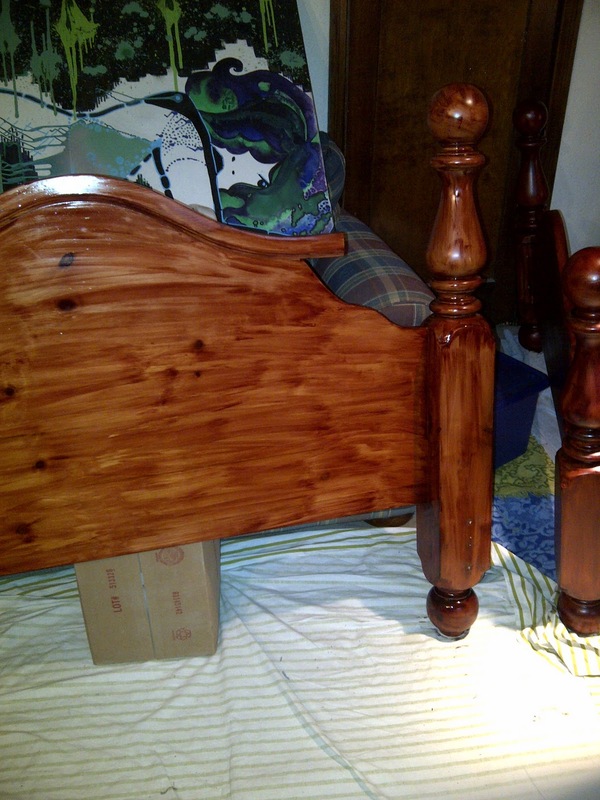 Starting this morning we still had to sand down the headboard and then put the first coat of stain on it. Then steel wool down the side rails and the foot board that we had previously stained and then do a second coat of stain on them. Based on how long it took us last time we thought this was going to be an all day event. BUT we apparently have improved on our processes because we flew through it! You live you learn!! Well we certainly learned!! One thing we both learned was this time we were opening more windows/doors to vent the fumes outside so the house wouldn't be so stinky!! Haahaa! Anyway on to the pictures. Here is the foot board all finished. 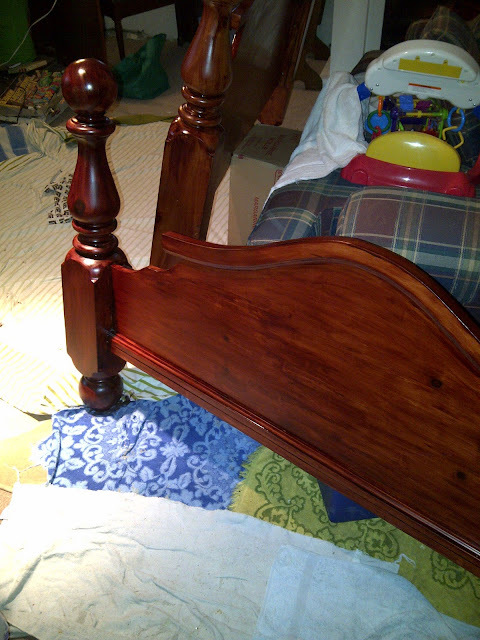 It has 2 coats of Minwax 2 in 1 (stain and polyurethane). I love this stuff, its super easy to use! You can brush it on and just leave it, no messy wiping it down and you don't have to add polyurethane after. Its a lot less glossy too and that's why I love it so much! After the second coat it really darkened up. You can see in the background the headboard with its first coat on, big difference in colour! 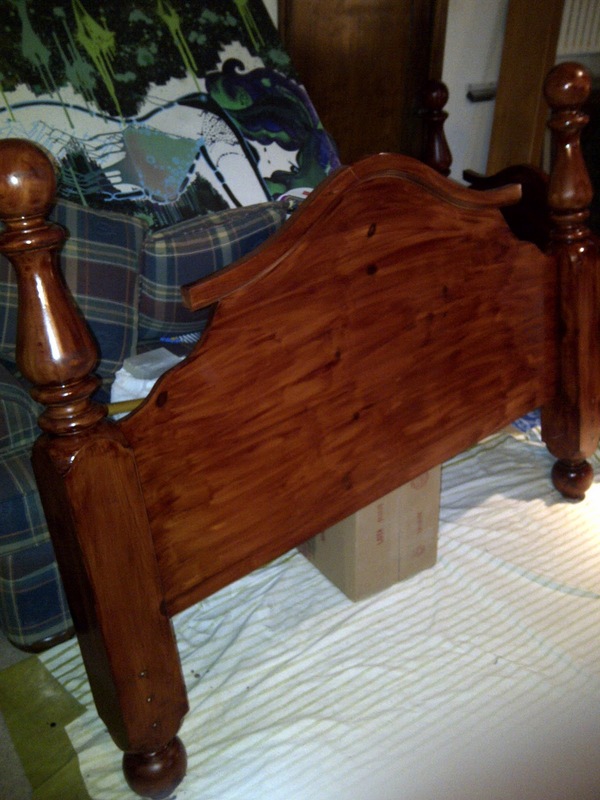 And here is the headboard with the first coat of stain. It was still very wet so you can see the brush strokes but those disappear as it dries. Anyway all that's left to do is steel wool down the headboard and stain a second coat which should take about 40 minutes. I plan on tackling this next week. I promise to post photos once its set up at Kelitas!! It looks soo amazing!!! HIGH FIVE KELITA we are awesome!! !